Encouraging innovation and managing creativity often needs specialised support and experience. Creativity doctor Peter Bloore (MBA) is an expert in innovation, whether it is setting up a specialised R&D unit; providing customised training to encourage creativity; designing a corporate strategy for innovation; facilitating brainstorms; brand development; or changing the internal culture of your organisation. He can also work strategically with senior management at non-executive board member level. He specialises in the media, leisure, travel and entertainment industries, as well as the charity sector. He has a background in creative writing and story development.Current work includes innovation consultancy for Merlin Entertainments PLC (see below); development executive for wavelength films; and head of story and concept development for an innovative new touring arena show, scheduled for 2018. He is a university senior lecturer in creativity, innovation and business management, and author of a recent book on creativity. Unusually, he also has a PhD in Creativity. He can be contacted at peter@peterbloore.com. For the last four years Peter has been the chair of the R&D and Innovation Unit of Merlin Entertainments PLC, which owns and operates global leisure brands and attractions such as Legoland, Thorpe Park, Madame Tussauds, Sea Life aquariums, Warwick Castle, Alton Towers, London Dungeon and the world-famous London Eye. The Group comprises 94 attractions, seven hotels and two holiday villages in 21 different countries. Merlin is number two to Disney in worldwide visitor attractions. Peter’s work for Merlin began by creating and managing its R&D innovation team. He recruited a mix of creative outsiders, specialist designers, and senior Merlin executives to develop ideas for the future of Merlin’s ever-changing entertainment and leisure offer. The team’s brief includes dreaming up the next city centre and theme park attractions, resort hotel propositions, IP brand associations, and opening up new business and leisure opportunities. Amongst other projects he has been developing concepts for new rollercoasters and water rides for the theme parks, and working on future brand development. With new technology and exciting changes in the entertainment business, what could the resort theme park of the future be like? In the last twenty years Peter has worked as a consultant for entertainment and media companies in concept development, business strategy and finance. Clients have included the Media Xchange Consultancy; Prescience Film Finance; Ken Loach’s Sixteen Films; the National Film and Television School; Number 9 Films; Parallax; and Rainy Day Films. His work sometimes includes working with teams on idea development and finance; and creating compelling new story ideas and format concepts. Stories are his passion. He is a produced feature film screenwriter (The Truth About Love, starring Jennifer Love Hewitt and Dougray Scott, released in 2005 in 22 territories worldwide) and is now completing a thriller novel called I’ll Be There. 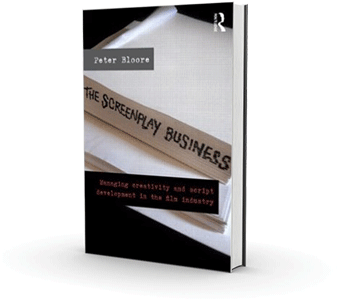 Peter’s work in creativity in film and TV culminated in his Routledge book The Screenplay Business (2012). In a cross-disciplinary academic study, he explores the secrets of the film business drawing on creativity, psychology, motivation, film studies, media value chains, and MBA business theories. His book includes chapters on the creative process, managing creative people, organisational culture, power relationships, business finance, building a new media business, and creative leadership. This year he has also published a book chapter on the hidden creativity in historical reconstructions, called Historical Digital Reconstruction: the role of creativity and known unknowns. Buy The Screenplay Business, at Amazon.co.uk or at Abebooks. Academically Peter is based at the University of East Anglia, famous for its creative writing courses and the Sainsbury Centre for World Art. He is senior lecturer in creativity (part time), and teaches media business, managing creativity, and film and TV project development for the MA in film, television and creative practice. He designed UEA’s ‘PhD by professional practice’, and supervises practice-based film and creativity PhDs. He is visiting senior lecturer in media business at Bournemouth University (teaching managing creativity and innovation, organisational culture, and change management); and is a visiting tutor at the London Film School (teaching screenplay development), including their International Film Business MA in association with Exeter University. From 2006 to 2009 Peter was permanently employed as senior lecturer at Bournemouth University’s media school (including the HEFCE-endorsed centre for excellence in media practice) and was course leader on the UK’s first media MBA. From 2005-2006 he was Associate Director of the Film Business Academy at Cass Business School in London. His full academic CV can be found on the UEA website by clicking here or at www.academia.edu here.